A talk by Katherine Findlay. 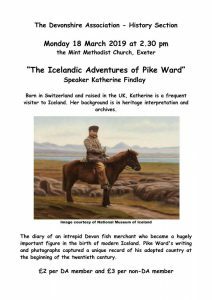 Pike Ward was a Teignmouth fish merchant who at the turn of the last century instigated such trade with Iceland that he became a hugely important figure in that country’s history, being awarded the Grand Cross of the Order of the Icelandic Falcon. In her book about his 1906 diaries Katherine has also provided an excellent introduction to both the background of Ward’s work and a potted history of Iceland. No need to book: £2 for DA members; £3 for non-members. Click on the image to the right to see the flyer for the event.